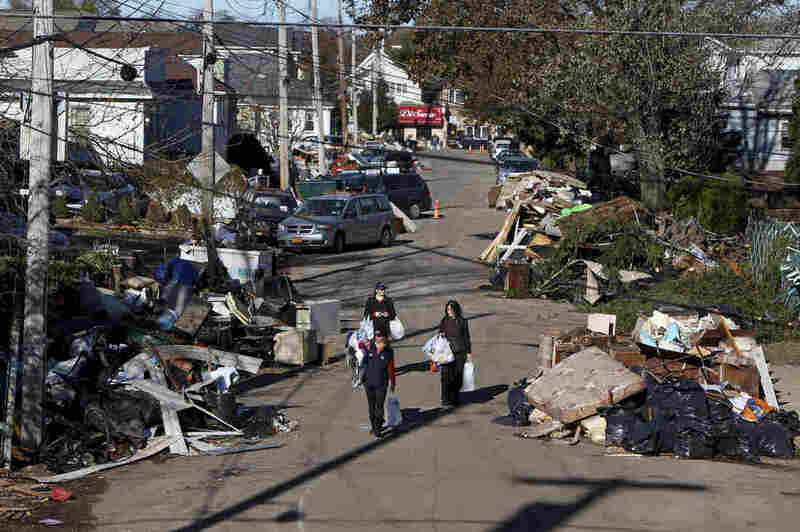 Business Of Disaster: Local Recovery Programs Struggle To Help Homeowners State and local disaster relief programs are leaving communities impacted by Superstorm Sandy confused by the dizzying array of directives on how to rebuild. Nick and Diane Camerada stand inside their home on Staten Island, N.Y. During Superstorm Sandy, the Cameradas had water up to the second floor of their home. More than three years later, they are still living in a home that is only partially renovated while continuing to deal with bureaucratic nightmares. This story is Part 2 of a two-part series. See our first piece about insurance firms that profited $400 million after Superstorm Sandy here. This story was produced in partnership with the PBS series Frontline. The night of Superstorm Sandy, Nick and Diane Camerada decided not to evacuate. Instead, they stayed with their four boys in their Staten Island, N.Y., home. In 20 years, their house had never flooded. They thought: How bad could it be? But that night in October 2012, the water pooled up through the floor. "You see the water rising and you wonder if it's ever going to stop," Diane Camerada says. They lost everything on the first floor of their home. 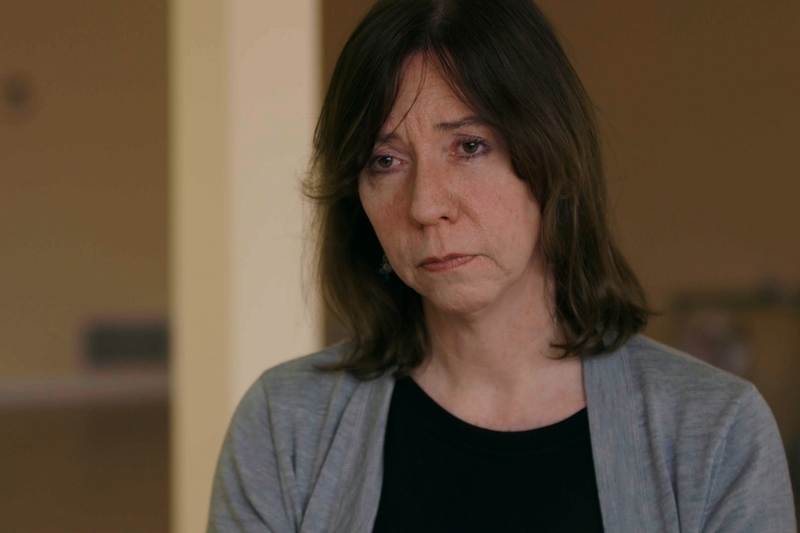 "We looked at each other, we had nothing," Diane said. Two weeks later, President Obama toured their neighborhood to see the devastation. "He came right to me," Diane Camerada remembers. 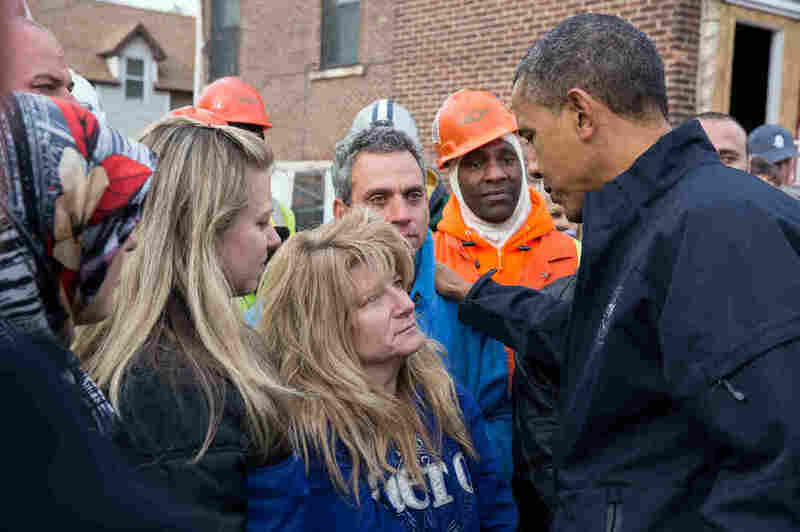 President Obama talks with Diane and Nick Camerada (center) during a walking tour of Superstorm Sandy storm damage on Staten Island, N.Y., on Nov. 15, 2012. President Obama told the couple, "My commitment to you is I'm going to stay on it." Diane Camerada responded: "Just don't forget about us." Three years later, her first floor is still a wreck, and down to the studs. She digs out a copy of a newspaper, with a picture of her talking to the president. "I want to take this and put it in a manila envelope," she says. "And I want to mail it to him and say, 'Remember me?' Because we're still suffering down here. And it's not just me. It's a lot of my neighbors, too." Scientists say powerful storms are becoming more frequent and more intense. Yet there's no guidebook or national plan for how states and communities are supposed to recover. What the country does have is money. Taxpayers sent New York and New Jersey $8 billion after Superstorm Sandy through federal recovery programs. But driving around some of the hardest-hit areas, it's difficult to see where all that money went. Garbage is piled up on the street in the New Dorp neighborhood of Staten Island, N.Y., on Nov. 4, 2012, in the aftermath of Superstorm Sandy. NPR and the PBS series Frontline have spent the past year investigating the business of disaster and found that millions of taxpayer dollars have gone to waste, mired in bureaucracy and red tape. New York City, like most places after a disaster, built its recovery program from scratch. And in New York, like those other places across the country, those efforts have not been very effective. On a recent morning, Tommy Consulo, a community leader who is helping people navigate the rebuilding process in Staten Island, is driving around some of the neighborhoods closest to the water. Block after block, dozens of homes look like they did three years ago — boarded up and abandoned. Other homes have been knocked down and their lots are empty. And still others have been elevated to avoid future flooding. "This is New York," Consulo says, looking out the window. "If we can't handle a situation like this any better than the way we handled this one, the rest of the country's in trouble." He pulls around a corner and points to a rickety one-story bungalow no bigger than a trailer home. It's now on stilts — 15 feet in the air and taller than any house on the street. "See how high it's going to be?" he says in almost disbelief. "That's the height you gotta be." Residents call this the "jack-o-lantern effect," because the lines of homes look like the teeth of a smiling pumpkin on Halloween. This is the product of multiple city, state and federal programs, which each encourage residents to do different things: renovate, elevate their homes or sell to the state so the house can be leveled. 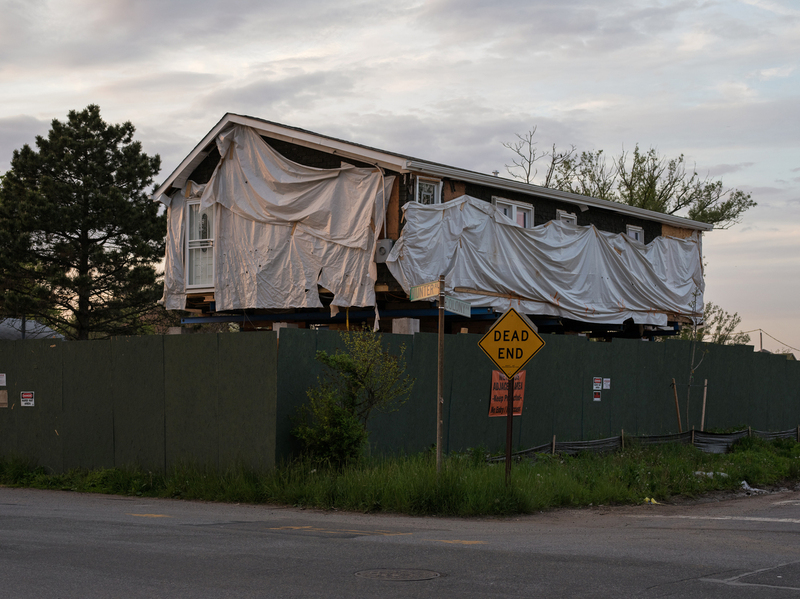 "Ninety percent of the community will have disappeared, and there will be a handful of homes that will try to weather the next storm," says Frank Moszczynski, a construction manager for several projects in the area. He decided to take a buyout from a state program, so his own nearby house is now boarded up. "I would definitely move back here if I had the chance," he says. If you're thinking no single agency or organization seems to have a plan for this neighborhood, Staten Island or along this entire coastal area, Consulo and Moszczynski say, you're right. Homeowners are left with a dizzying array of directives and programs. The men say residents have to navigate at least five local, state and federal agencies when figuring out what to do with their homes and many don't know how to do that. "People don't know because they don't understand that process, and you know what?" Moszczynski asks. "It's a very difficult process." For as much as homeowners may not know their way around recovery programs, the government has trouble, too. A sign for the Build It Back program hangs on the plywood fence of a construction site on Staten Island, N.Y.
New York City created Build It Back, a program using federal dollars. At first, the city hired private contractors to run it. The results weren't good, and during the first year of the program, there were problems with mismanagement, overbilling and incompetence, according to government auditors. The city audit found that Build It Back paid its workers little more than minimum wage — but then charged the city a total fee that was based on rates of $40 to $100 an hour for those same jobs. It also said that in other instances, contractors billed the city $200,000 monthly retainers at a time when few homeowners were getting help. In an area where more than 300,000 homes were affected, taxpayers will have spent $1.7 billion on a program that is planning to elevate 2,000 homes and help renovate 7,000 others by the end of the year. Amy Peterson was brought in to overhaul Build It Back and says homes are now being elevated. She also says three-quarters of the people in the program have either received a check for renovations or had construction started. Peterson says she is optimistic. Amy Peterson now runs the Build It Back program in New York City. She says she is optimistic about the program. "It's going really well," she says. "And we have worked really hard to help these communities recover. We really overhauled the program to make it work for homeowners so they can get where they want to be." The Cameradas haven't seen those results yet. They signed up for Build It Back not long after they met President Obama. But they say program officials told them they would have to close old building permits from a home renovation in 2006 before Build It Back would elevate their home. To do that, the Cameradas said they would have to renovate their first floor, knowing it would get ripped out if the house got elevated. "The floor, the walls, the doors, everything is going to be thrown away so that the house can be lifted and rebuilt," Diane said. "It just doesn't make sense." 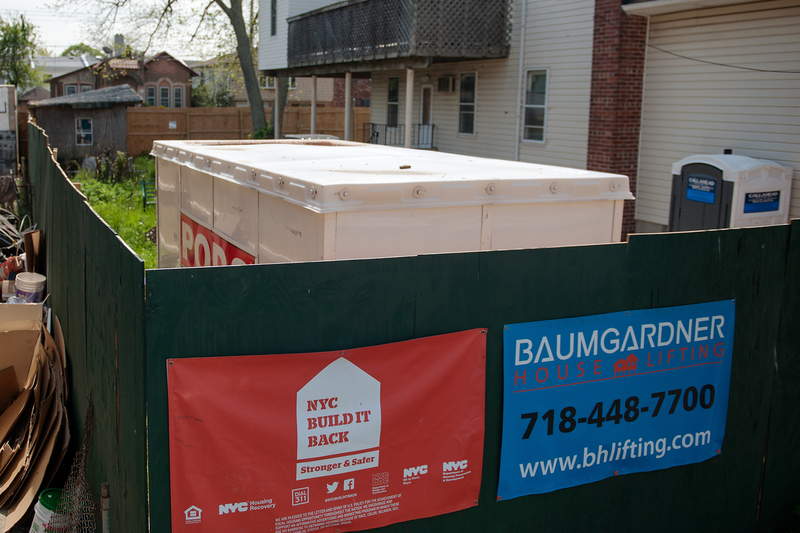 Diane Camerada stands inside her home on Staten Island, N.Y. She has been frustrated with the long bureaucratic process with the Build It Back program. A couple of months ago, the Cameradas went ahead and did that renovation. They're still waiting for their home to be elevated. "It's not only government being irresponsible," says Jim Oddo, the Staten Island borough president. "It's an embarrassment to all of us as professionals. We're not making widgets. This is not like we screwed up the conveyor belt. These are people." Oddo hadn't heard about the Cameradas' situation. But he started listing other examples of homeowners facing confusing decisions and delays that lasted years. "Oh my God, where do you start? Let's take a home that's worth $80,000 and let's pour $600,000 into it to elevate it and rehab it," he says shaking his head in disbelief. "That's one case that happened." 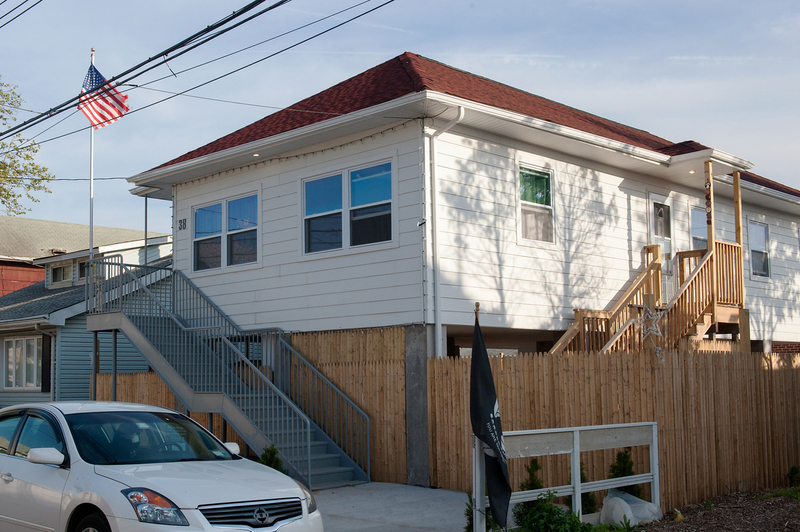 Following Superstorm Sandy, Nicole Chati received $600,000 to repair her home. Now, it sits on stilts that rise above the other homes in the neighborhood that have yet to be raised. The house is a one-story bungalow now elevated on Topping Road. Build It Back officials acknowledge they spent $600,000, but they say it was an outlier that ran into complications. Homeowners here say New York had too many agencies with different ideas, that it didn't know how to run a housing recovery program, and that it has not been able to decide on the future of its coastal areas. But the problem for the rest of the county is that few other places seem to know how to do it better. Allegations of mismanagement and years-long delays in programs have also dogged New Jersey; Louisiana had troubles after Hurricane Katrina, Texas after Hurricane Ike; and Florida, after Hurricanes Frances and Andrew. "The way that the Congress provides the money, they want us to let the local government make those decisions," says Marion McFadden, the deputy assistant secretary for grant programs at the U.S. Department of Housing and Urban Development. A recently elevated home in Staten Island, N.Y. Asked if she thinks she or the program could have provided more oversight, she says: "Is there a better way of doing this? I hope that there is, or that we can all work together to do this way better, because that's what people are counting on the federal government for." Brad Gair, one of New York City's disaster recovery managers, says without hard choices about how and where to rebuild, or even whether to rebuild, states and cities will keep reinventing a broken wheel — despite their best efforts. "We're not in a good place," he says. "I thought if I saw the problems and talked about the problems that we could fix it." "The exact same thing that happens every time on these," he says. "It went bad quickly. We can't afford to keep doing this. Will we keep doing this? I think we will keep doing this exactly the way we're doing it." Frontline's Emma Schwartz, Rick Young and Fritz Kramer contributed to this story.